SAN ANTONIO - A Bexar County sheriff's deputy was suspended without pay for 40 days in January after authorities discovered he had a relationship with a woman whom he had met while on duty, records show. The Sheriff's Office has declined to release any internal affairs materials relating to the suspension of deputy Anthony A. Alvarado. According to disciplinary documents Alvarado had "encounters" with the woman, often while on-duty. However, suspension paperwork failed to elaborate on the nature of the pair's relationship or their encounters. 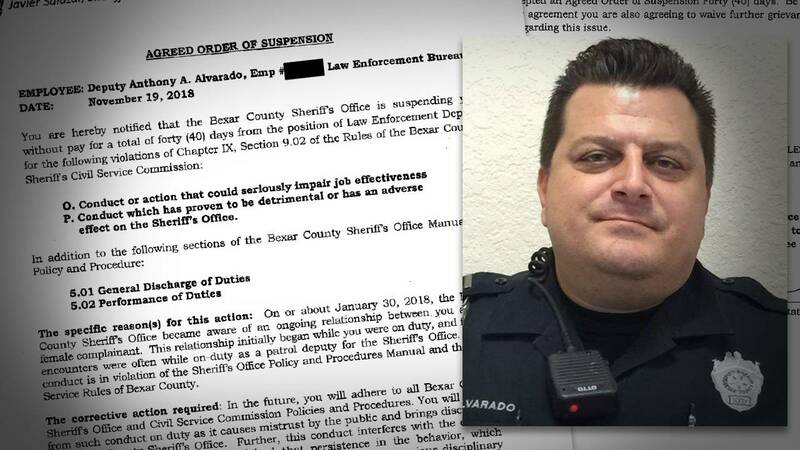 The documents note that Alvarado's conduct "seriously impair(s) job effectiveness," and has "proven to be detrimental or has an adverse effect on the Sheriff's Office." Suspension paperwork states that authorities became aware of the relationship in January 2018. Alvarado's personnel file notes that he was placed on paid administrative leave from the Sheriff's Office around the same time. He was later reinstated to administrative duty in April 2018. A letter from the Bexar County District Attorney's Office sent Wednesday to the Office of the Attorney General of Texas seeks permission to withhold internal affairs files relating to Alvarado's suspension, citing the fact that the information "pertains to a sexual harassment investigation." The documents do not state whether Alvarado was the subject of the sexual harassment investigation.